Stalled talks between Pyongyang and Washington likely cause for deceleration of diplomacy. North Korean leader Kim Jong-un’s visit to Seoul appears to be less likely to take place this year without more progress in stalled denuclearization talks between Pyongyang and Washington, experts said Sunday. South Korea’s Moon Jae-in administration is pushing to hold the fourth inter-Korean summit between Moon and Kim in Seoul within the year, in the hope of facilitating a breakthrough in the deadlocked US-North Korea talks. One of the unexpected achievements from the third summit, which was held in September in Pyongyang, was the North Korean leader’s promise to visit Seoul within the year. President Moon said at his speech at the National Assembly earlier this month that Kim’s visit to Seoul will take place in the near future. Unification Minister Cho Myong-gyon said Friday at a parliamentary session that Kim’s visit to Seoul within the year is “possible,” and the ministry continues consultations with North Korean officials. In a display of closer inter-Korean ties, the presidential office sent a gift of 200 tons of tangerines to North Korea on Sunday. The gift was in return for the mushrooms North Korea gave South Korea following the third summit between Moon and Kim. But Kim’s visit to Seoul is closely linked to the result of the US-North Korea high-level meeting, as holding another inter-Korean summit without progress in denuclearization talks with the US could be a burden for the North, experts say. The meeting between US Secretary of State Mike Pompeo and Kim Yong-chol, vice chairman of North Korea’s ruling Workers’ Party Central Committee, did not take place as planned Thursday. The North postponed it, citing “hectic schedules,” according to South Korean and US diplomats. While the delay might have resulted from “scheduling problems,” there is speculation that the cancelation indicated stark differences between Washington and Pyongyang over who should make a concession first before moving on in their denuclearization talks. 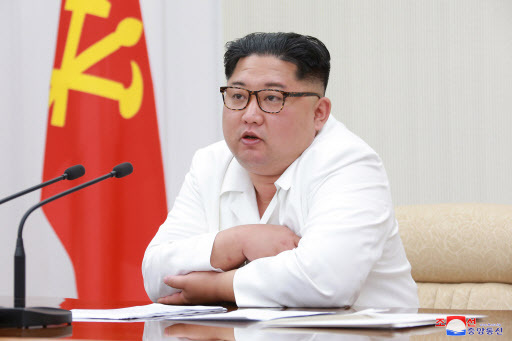 North Korea is calling on the US to ease sanctions before it takes further denuclearization steps, while the US is making clear that it will continue to impose economic sanctions on the North until it completely denuclearizes despite ongoing engagement with the reclusive country. US Vice President Mike Pence said the US will “continue to exert unprecedented diplomatic and economic pressure on North Korea” until it achieves the complete denuclearization of the Korean Peninsula in an op-ed published Friday in the Washington Post. The US was also seen trying to get China, North Korea’s Cold War ally that is locked in a trade war with the US, on its side for implementation of the sanctions during their bilateral meeting on Friday. Pompeo said that China’s cooperation “will help achieve meaningful breakthroughs on this important denuclearization issue,” after he met with his Chinese counterpart during the meeting, called the US-China Diplomatic and Security Dialogue. US President Donald Trump said last week that Washington is “in no rush” as the sanctions are still “on” during a press conference following the US midterm elections. In response, North Korea is using its state-run news media and propaganda websites to express discomfort about the US’ calling for tighter enforcement of the sanctions against the North, and the slow pace of inter-Korean projects. “If the US does not implement the (June 12) joint statement but prefers to stick to the status quo by making a case for adjusting speed with such an expression as ‘in no hurry,’ there is no reason to bother to have talks,” Japan’s pro-North Korean newspaper Choson Sinbo said in an article, apparently targeting Trump’s recent remarks. With the prolonged stalemate in denuclearization negotiations between the US and North Korea, it appears to be difficult for Kim to visit Seoul and inter-Korean projects to further move ahead this year. “South Korea will continue to try to make room for the US and North Korea to continue negotiations and ease tensions between the countries through Kim Jong-un’s visit to Seoul,” said Park Won-gon, a professor at Handong Global University. Shin Beom-cheol, research fellow at the Asan Institute for Policy Studies, also said that there is a lower possibility of Kim visiting Seoul this year. “ I think North Korea would want to come to Seoul on the back of some progress in its relations with the US so that it could gain economic rewards — economic assistance, for example — from South Korea,” he said.